Ekumfi Otuam (C/R) Sept. 6 GNA - A Deputy Minister of Local Government and Rural Development, Mr Elvis Afriyie-Ankrah has called on Ghanaians, especially those working at the Birth and Death Registry to help check the abuse of the Ghanaian birth certificate. Addressing the 8th Birth and Death Registration day at Ekumfi Otuam in the Central Region, Mr Afriyie-Ankrah expressed concern about the use of the Ghanaian birth certificate and other documents by non-Ghanaians to apply for Immigration Services. 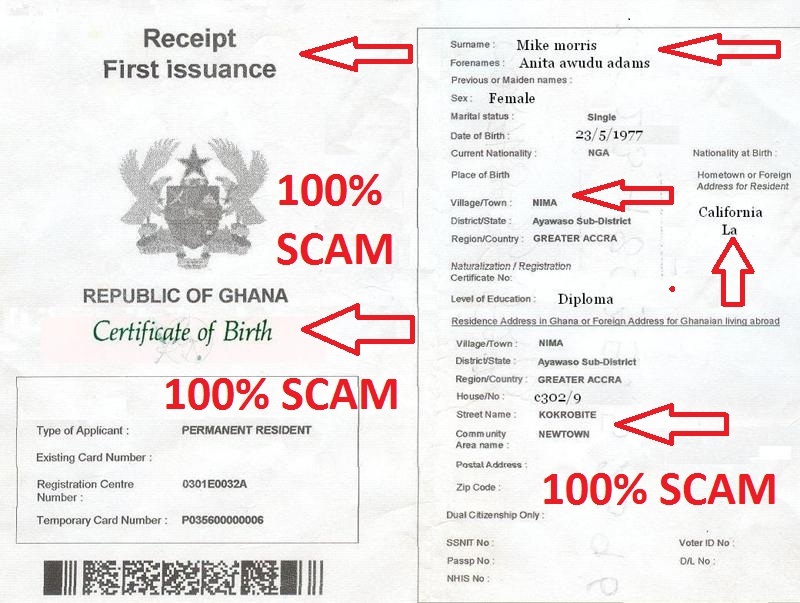 * This is a clear fake birth certificate, but there is a high risk, that Nigerian SCAMMERS, are able to get a official one, to scam people, all over the world..! 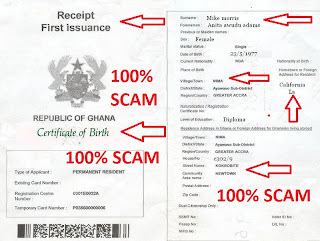 “The ease with which those unscrupulous persons manage to obtain Ghanaian birth certificates and misuse them, is an issue that needs to be checked and rooted out”, he said. September 1, each year, has been set aside as Birth and Death Registration Day, since the first death, registered in Ghana was done on September 1, 1912. Mr Afriyie-Ankrah said there was an instance where certain persons holding Ghanaian passports had been arrested and repatriated to Ghana only for the authorities to establish that they were not Ghanaians. “Where did they get the Ghanaian birth certificate to apply for the passport”, he questioned. The Deputy Minister said some people had engaged in insurance fraud, putting in claims for living relatives who were fraudulently registered as dead. He said by this behaviour the miscreants end up destroying the credibility of Ghanaian documents and the reputation of the country in the eyes of the world. The Deputy Minister said birth and death registration was essential for equitable distribution of limited national resources and also to put to rest arguments about the ages of the players of the junior national football teams. Please Read Also Our Other Scam Warnings!